Overall this reviewer liked this book. It managed to provide a lot of information and convey a sense of personality whilst not crossing the line to overt personal promotion and I, I, I-type writing. Buddy Valastro and his family business, Carlo's Bake Shop, have become a worldwide phenomenon, thanks to his popular television shows, Cake Boss, Kitchen Boss, and Next Great Baker. And Buddy knows far more than "just desserts." As a great cook, he uses his own personal touches and flair to make these favorites and classic dishes even more delicious, and also shares tips passed down through generations. From 100 easy-to-follow recipes that use ingredients that are easily obtainable and affordable, here is the all-important Sunday Gravy (tomato sauce), a foundation for many a pasta meal, as well as Steak a la Buddy, Auntie Anna's Manicotti, Buddy's Swiss Chard, and mouth-watering desserts like Lemon Granita, Apple Snackin' Cake, Cocoa-Hazelnut Cream with Berries, and Rockin' Rice Pudding. Buddy's recipes allow anyone to become the boss of their own kitchen and even novice cooks will be able to whip up a tasty and nutritious Italian dinner. 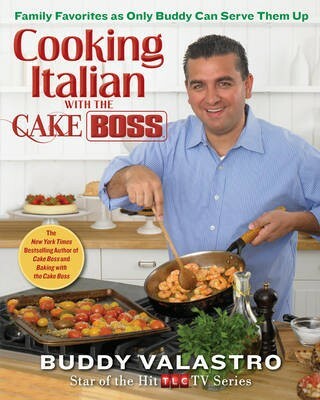 Fully illustrated in color and with nostalgic family photos from the extended Valastro clan, Kitchen Boss shows how to make the meals that will make your famiglia happy.